In 2015, United Nations set a series of goals to fight against poverty. The EU has taken the challenge and, within the topics brought to the table, it highlights the access to worthy housing and the problem with homelessness. The European network Feantsa urged to make effective policies to achieve the goals set before 2030. At the European Union (EU) it is known that there are 219.9 million homes and that, in average, each home invests 40% of their incomes to pay housing. It is also known that 16.8% of the families (near 40 million) live overcrowded and 4.8% of the families (about 11 million) confront a deprivation situation at home. The figure is unknown, however, it is the number of people who live in the European Union that live on the street or don’t have a home. This information is given by a survey made in 2017 of the European federation of national organisations that work with homeless people (Feantsa) and the French organisation Abbé Pierre, that warns about the increase of the people that sleep on the street in the European countries except in Finland. The calculation is not easy because there are not any common approaches to bring together these kind of figures. In England, in a night recount made last year 4,751 people sleeping on the street were counted; in comparison to 2014, the figure has increased by 160%. In Germany, it is calculated that there are 860,000 homeless people and the figure has increased by 150% between 2014 and 2016. In Belgium, in 2016 3,386 people sleeping on the street were counted in only one night, 96% more than the previous year. The goal of the EU is “to achieve inclusive, safe, resilient and sustainable cities and human settlements” and wants to guarantee before 2030 “that everyone has access to housing and appropriate basic, safe and affordable services”. This goal is one of the 17 approved goals in 2015 at the Sustainable Development summit of the United Nations and that was signed by 193 Member States. Another goal accepted by the EU and the significant fight against homelessness is “to eradicate extreme poverty before 2030 to every person of the planet”, and “to reduce at least 50% of the people who live in poverty”. 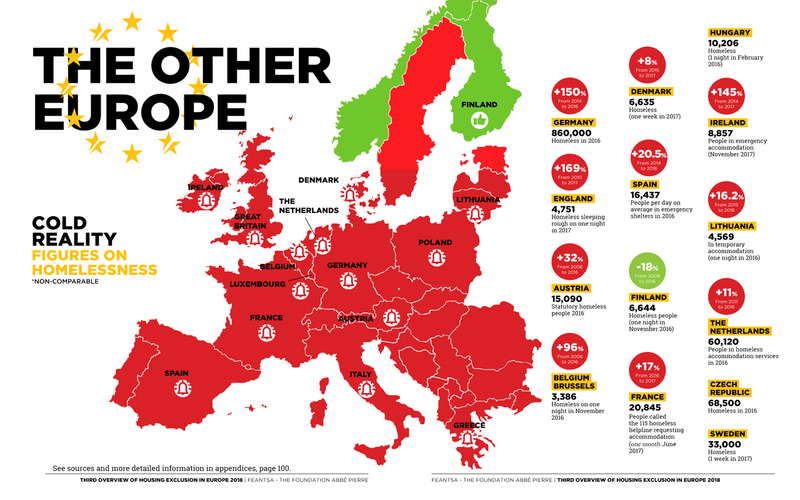 According to Feantsa, the lack of housing is maybe the most extreme and obvious representation of poverty in Europe, as well as one of the least discussed and visible problems of the public European policies. In this sense, it is also spoke about health and well-being because the lack of housing is directly related to health damage and it reduces the estimate life. Last year, for example, in Barcelona 57 people that lived or have lived on the street died; the average age is 59 years old. 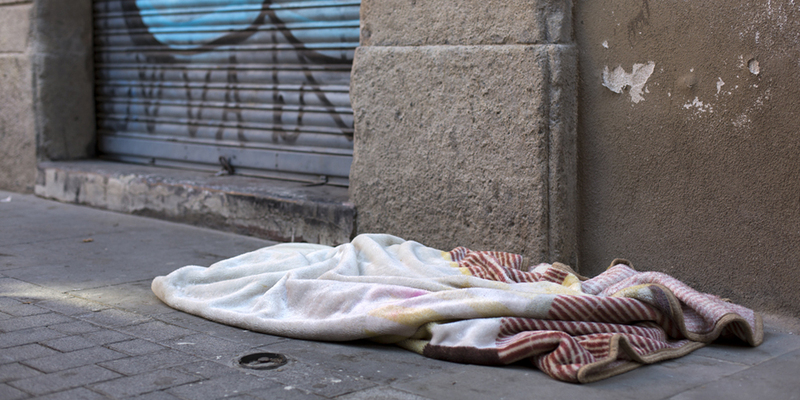 To know how many people sleep on the street and sizing the problem, as well as to set survey and standardisation mechanisms to know of what we are talking when we talk about homelessness in Europe. Sizing will allow to develop a European effective policy against homelessness. This action plan must walk away of the traditional assisting model that gives priority the access to shelters, according to Feantsa. More real compromise and more effective actions. To make visible the problem, it should create an increase of the investments and resources in the local area. At the same time, the EU should make a tracking of the actions put in place by the Member States and monitor the results. All the initiatives should have mainstreaming vocation and should be assimilated in other sectoral policies, like the ones intended to young people, migrants or to jobs. We have to stop talking about “managing the lack of housing” and start acting to “end with the lack of housing”, said recently Leilani Farha, in representation of the United Nations, in a meeting organised by the European network Feantsa that gathered more than 350 governmental and non-governmental organisation leaders that fight against homelessness. For its part, Feantsa director, Freek Spinnewijn, emphasized the fact that most of the policies driven so far by the European Union have not been proved efficient and they have not been seen by the people interested in them. Relocation offer must be immediate, anyone should not live on the street more than two days. To criminalise and punish someone who lives on the street has only one consequence: it alienates homeless people of the possibility to improve their situations. Each time more women are living on the street and homeless women are a doubly vulnerable group. We have to start up prevention and alert policies, to avoid the increase of the number of women living on the street and to detect and take action against possible abuses. It is necessary to pay special attention to migrant women: to modify social benefit systems so they can bear in mind migrant people, to increase resources and to improve the legislation and the visa and asylum policies. Read the survey about the access to housing exclusion in Europe, of the Abbé Pierre and Feantsa foundation.